Today is the feast of Blessed John Paul II. 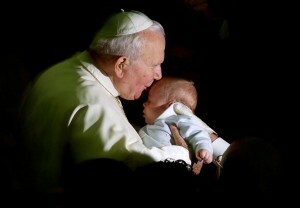 He is often referred to as John Paul the Great, but I will always know him simply as JPII. No doubt he was a mighty world/religious leader, but to many of us who grew up under his pontificate, he was also a gentle and humble shepherd who seemed as close and personal to us as our own fathers. 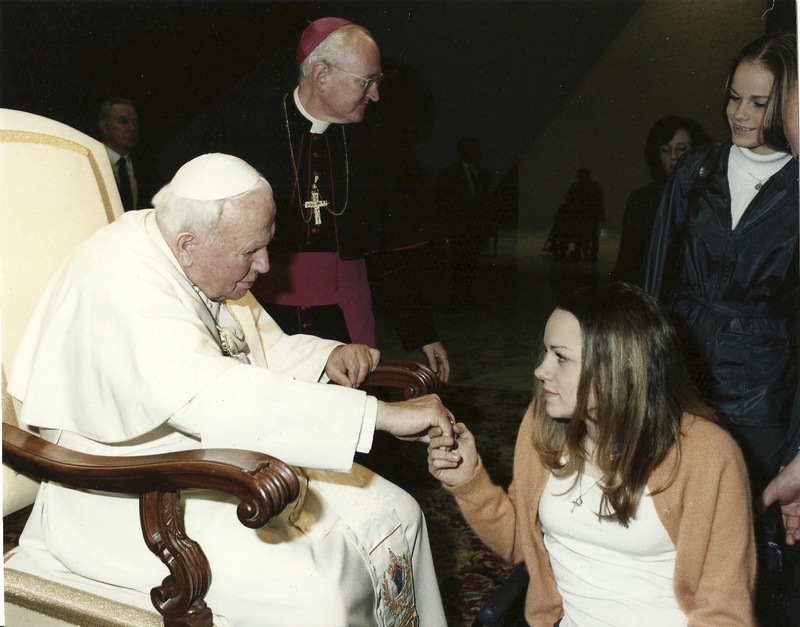 Growing up in Poland during the Nazi occupation of that country during World War II, JPII experienced first had the horror that a culture that does not value all human life produces. Today the struggle for human rights and freedom continues, so, for me the greatest “legacy” he left us was his enthusiasm for articulating the Church’s commitment to building a culture of life. There are a number of ways in which a culture of life must be built. First, quite obviously, is recognition and respect for the unique dignity of the human person and our relationship to God and each other. In TOB, JPII encourages a true reverence for our bodies and the gift of our sexuality and challenges us to live it in a way worthy of our great dignity as human persons (from the TOB website). This is not only true for weakest and most innocent members of our society – the poor, the sick, the unborn, the elderly, the embryo in a petri dish – but it includes loving the life of a criminal and our enemies (Mt. 5:44), as he showed by visiting and forgiving the man who tried to kill him. Along with the Theology of the Body he also wrote, before he became pope, an incredible book on responsible love as it relates to marriage and sexual relations. Love and Responsibility is a deep and frank discussion on everything from “The Person and Love” to “Sexology and Ethics” and it would rather shock people to see exactly what a celibate priest understands and has to say on the matter. His 1994 Letter to Families, too, is a treasure and has been called a compendium of John Paul’s thought on human sexuality. A kind of mini TOB. A culture that respects all human life must have a joyful acceptance of human suffering. As we saw with the starvation of Terri Schiavo and many cases like hers, our society has a great disdain for human suffering which leads to the tragic death and outright murder of people whose lives are considered worthless. We can counter this by following the example of JPII whose physical health gradually deteriorated after the gun shot wound that almost took his life. Despite the obvious pain and suffering that came with his sickness, the pope never let it slow him down. He embraced his humanity with all its hardships and “imperfections.” Even in his final days, when his health was at its worst, he struggled to be in front of the faithful. In 1984 he also wrote the Apostolic Letter on the Christian Meaning of Human Suffering, Salvifici Doloris. A culture of life requires recognition of, and a relationship with, He who is Life itself. This is to be its very foundation, for Christ said, “I am the way and the truth and the life” (Jn. 14:6) and those who believe in Him shall not perish, but have eternal life (Jn. 3:16)! God is nothing if not merciful and it is never too late to come back to Him with all our heart. As much as we want to save lives, as pro-lifers and Christians we should have a great desire to help save souls as well. JPII was a great leader in the fight against the culture of death. Hopefully we will learn from his example and work to advance the culture of life with the same enthusiasm as the late pontiff. Blessed JPII, WE LOVE YOU! Pray for us! Me and my Holy Papa on February 14, 2001. As with you, Chelsea, JPII will always be “my” pope. I still catch myself thinking of him as “the” pope and mentally filling his name in when I hear the Eucharistic prayer. I remember when he was elected in 1977 – I was 8 years old and felt as though his election was something for me, personally. I always felt that about his pontificate, that he was there for me, that he was “my” pastor. He had such an uncanny way of connecting with people. I’ll bet many other Catholics feel the same. Let’s pray for the quick canonization of John Paul the Great and the spread of his blessings throughout the world.